Iceland is a country that has very diverse landscapes. With lava fields, waterfalls, black sand beaches, mountains, and geothermal fields, Iceland has scenery that can enchant anyone! During my trip to Iceland, I was constantly amazed by its beauty. I never once felt bored during the trip because I loved every place I saw. I hope these photos inspire you to visit Iceland if you haven’t already, and if you have I hope they bring back fond memories. View of downtown Reykjavik from the tower of Hallgrímskirkja church. This is a must-have shot for anyone who visits Reykjavik! A lava field outside Hellisheiði Power Station. It is one of the largest geothermal power plants in the world. View of a mountain from Gulfoss. Gorgeous scenery on the way to Skogafoss. Double rainbows at Skogafoss. On sunny days, you can usually see a single or double rainbow because of the amount of spray the waterfall produces. To get a sense of how big Skogafoss is, check out this photo that shows how tiny two people look next to it! Scenery on the way to Vik. Imagine living right under these cliffs! A farm near where Eyjafjallajökull volcano erupted in 2010. This scenery is like from another planet! Vik, Iceland on the way to Reynisfjara Beach. Mountains in Skaftafell National Park. A house in Skaftafell National Park. A van driving on the highway in Skaftafell National Park. Hofskirkja is a traditional turf church in Öræfi, Southeast Iceland. An iceberg floating in Jökulsárlón Glacier Lagoon. Scenes from the James Bond movie Die Another Day were filmed there. I watched the movie on the plane ride to Iceland. Diamond Beach near Jökulsárlón, where you can find diamond-like chunks of ice lying on the beach. Sunset in the fishing town of Hofn. View from the walking path in Hofn. Near Djúpavogshreppur. Such calm water! Djúpivogur, a town in East Iceland. The village of Fáskrúðsfjörður was originally settled by French seamen. Street signs here are in both Icelandic and French and there is an exhibit about the history of the town in Fosshotel Eastfjords. Hverir, a geothermal field with Mars-like scenery. Large volumes of sulfur steam emit from the ground here, so the area has a strong rotten egg smell. On a cold day, the warm steam feels very comforting. A whale shows its tail near Hauganes, North Iceland. I took a boat tour with Whale Watching Hauganes and was amazed at how many whales I saw! Although none jumped out of the water, I saw their tails and fins many times. Icelandic horses grazing in a field near Kolugljúfur. I love their shaggy manes! 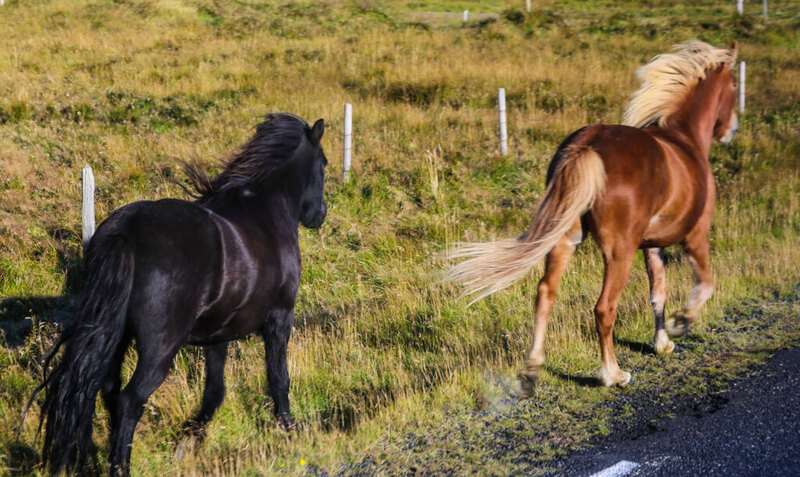 During the summer, most Icelandic horses spend their time roaming free. At the end of September/early October, the horses are brought down from the mountains to be rounded up and returned to their owners. During this time, some horse lovers from overseas join riding tours and help round up the horses. The most popular horse corral in Iceland is Laufskálarétt. I was taking photos of Kolufoss when I heard the sound of horses coming and immediately ran over to the side of the road to watch! It was an amazing experience to see so many horses galloping past and I was lucky enough to be in the right place at the right time. The rainbow waterfall, the whale and the horses are my favourites! Iceland is high on my list to go to ! What lovely pics. I think you have captured the essence of this beautiful country. Love the horse pic in particular. Iceland looks so amazing! Your photos are absolutely stunning and making me want to go right now. I can’t believe how adorable those horses are; I’m in love! I meannnnn….just giving me even more FOMO for Iceland! Wow the double rainbow over the waterfall is so stunning! Iceland seems like a dream and a completely untaimed place from your pictures. It is wonderful to immerse yourself into the nature beauty and not being disturbed by the hustle and bustle of the city. Just got back from Iceland and saw most of these places too! Beautifully captured! Looks like you were lucky enough to have amazing weather also! Unfortunately, we had very cloudy weather all but one morning. It was still amazing though! I love how Iceland changes landscape at almost every turn! It’s like 10 planets on one island. Wow. This pictures inspire me to travel to Iceland right now. I love the waterfall picture. Amazing work. It all looks so peaceful and tranquil. And I love places that are not overcrowded by tourists. Looks like the place to be! I visited Iceland last summer and absolutely loved it. The Icelandic horses are just the cutest! I’m planning to go back in the winter to see the Northern lights! Thanks for sharing your article brought back some nice memories of my trip. THese pictures definetly inspired me to visit Iceland. Wonderful. OMG, your pictures are so much better than mine. I have to go back! Beautiful pictures!!! I loved iceland especially all the waterfalls! Beautiful! What time of year did you go? I’m counting down the weeks until I head there myself!! I went at the end of September/early October. 🙂 Hope you have a great time in Iceland! Oh so gorgeous. I just added Iceland to my bucket list. Your photos are absolutely stunning! Iceland’s been on my bucket list for some time now and this just makes me wanna fly over ASAP! Love Iceland! I got to visit during a layover. Not a lot of time to explore but it was enough to want to go back. I miss Iceland. Been there twice already and want more. Some very beautiful photos and hope to return again soon. Absolutely incredible photos, the scenery in Iceland always blows me away! Those beaches look amazing too. And I love that turf church! I definitely need to explore Iceland more, it feels like when I visited it was just a whistlestop tour.